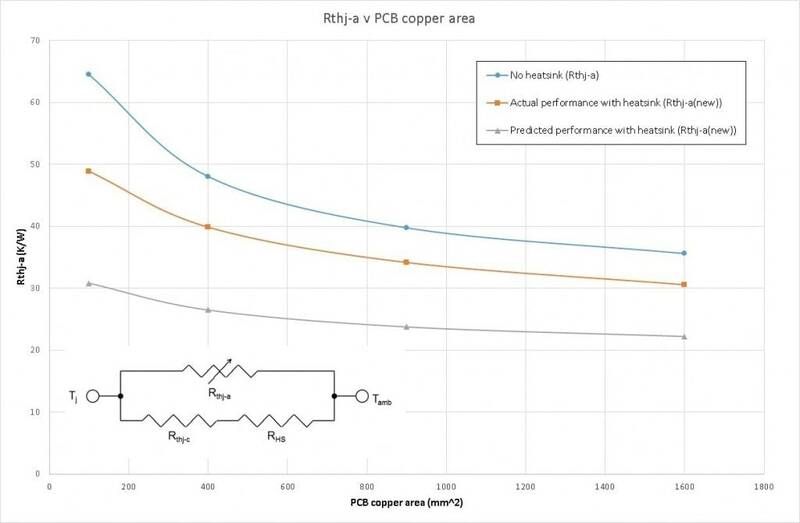 In my March post, I introduced the concept of “thermal resistance” (Rthj-a) as a measure of how easily a system is able to lose its heat energy to its ambient environment. 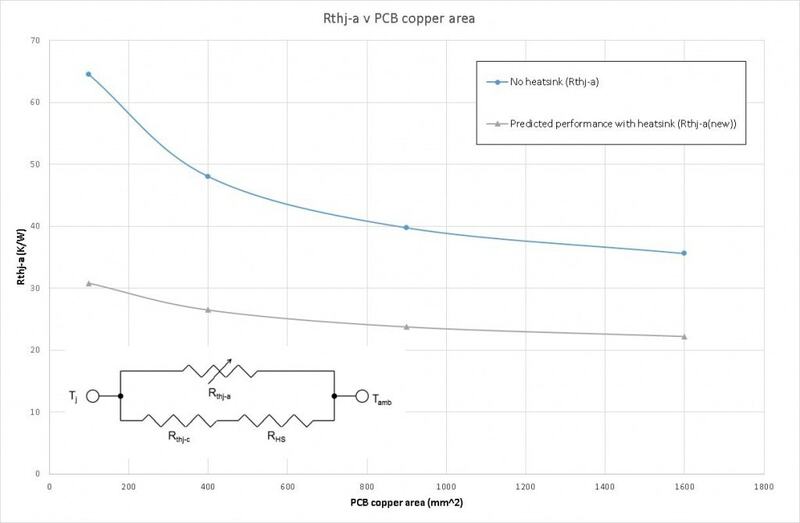 We saw that, for a MOSFET device mounted on a single-sided PCB, Rthj-a depends heavily on the amount of PCB copper to which the device is soldered. See Figure 1. I then went on to pose the question: “Is there another way in which we could assist the device thermal energy in its passage towards ambient? Would it help, for instance, if we put a heatsink on top of our device?”, as illustrated in Figure 2. Well that was unexpected. The results from simulation do not agree with those from the simple calculations. 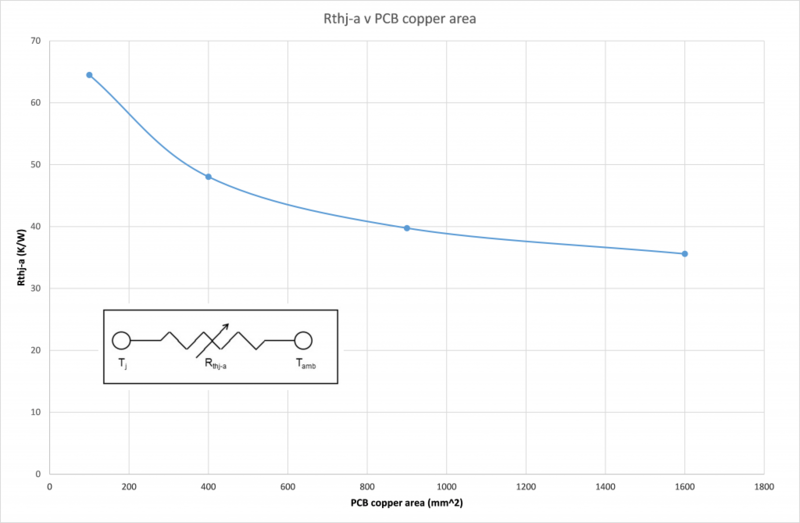 Although the simulations do show some benefit from adding the heatsink, the benefits are not as great as the simple calculations would lead us to believe. So why the big difference between what we expected and what we achieved? There are several reasons why, but probably the most important is that the ambient temperature “experienced” by the heatsink is not the same as the ambient temperature for the system as a whole. 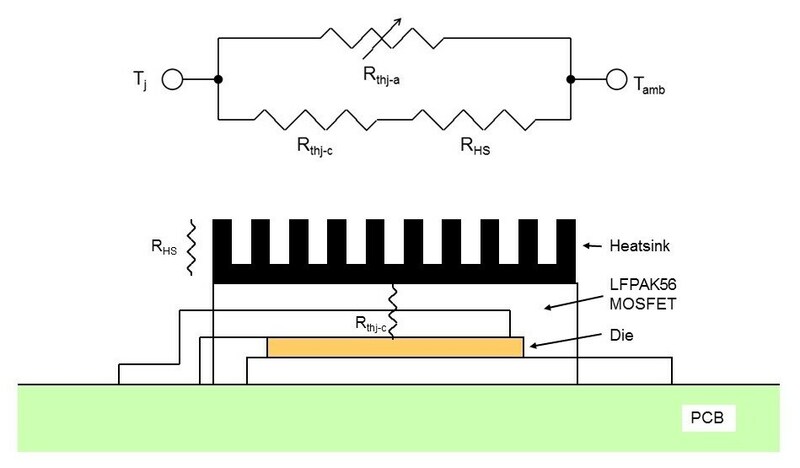 If you cast your mind back to Figure 2 of my January 2016 post, you will see an illustration of the blanket of hot air which appears above a PCB-mounted device when it is dissipating heat energy. When we place a heatsink on top of the device, the blanket of hot air also envelopes the heatsink and degrades its ability to further remove heat from the device. To put it another way: the heatsink is itself being heated up by hot air rising from the PCB surface. I’ve illustrated this phenomenon in Figure 5. 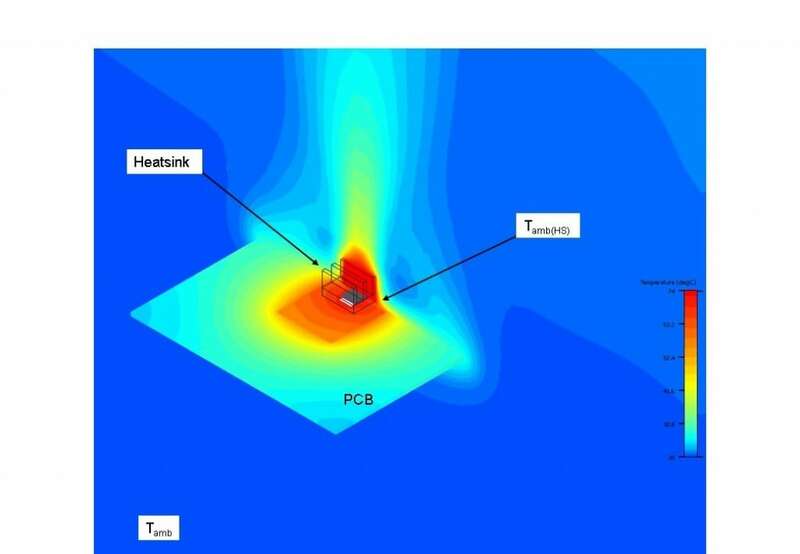 Figure 5 Thermal simulation plot of an LFPAK56 device with heatsink on a PCB. In effect, the heatsink now has its own local ambient temperature (Tamb(HS) in Figure 5) which is higher than the system ambient temperature Tamb. So going back to the thermal network of Figure 2 (top), we can see that the network is not quite as simple as we first thought, and needs to be redrawn as shown in Figure 6 (bottom). 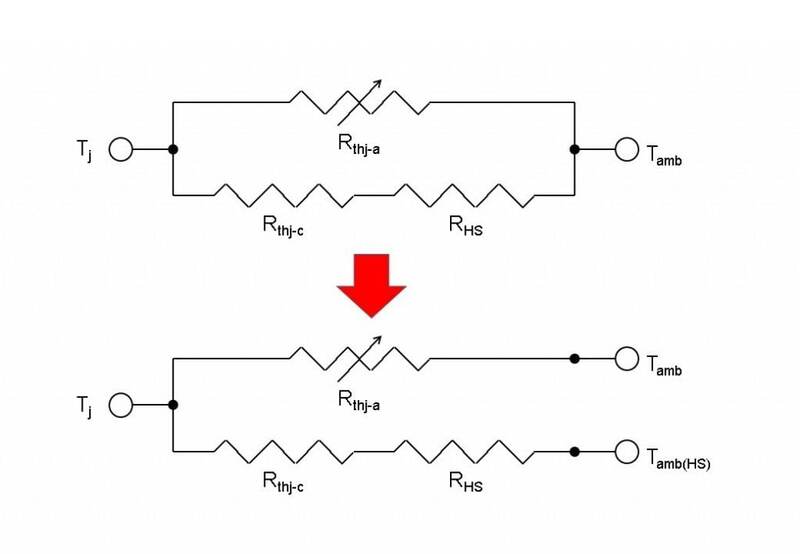 Figure 6 The original thermal network (top) and modified version (bottom). Sadly, predicting Tamb(HS) really is beyond the scope of simple calculation as it depends on the transfer of heat energy to the surrounding air in three dimensions. So, whilst attaching a heatsink to the top of a dissipating device will usually yield some benefit, the degree of benefit may be difficult to predict and will be less than simple theory suggests. If we apply some forced-air cooling to the scenario then manual predictions will become even more difficult – this is a topic I may return to in future blog posts. I’m out of space now, but thanks for reading and I hope to see you again next time for more thermal ramblings! I should also add that we have observed this phenomenon in real-life testing, so the results shown in Figure 4 cannot simply be explained away as some quirk of the simulation software. why after taking into account heat sink you went from TJ –Rja–Ta into the parallel configuration TJ–1–RJa–1-Ta and Tj -2-Rjc+Rhs-2-Ta. I’m refering to the Figure 2 top picture? Hello Pawel, and thanks for taking the time to read my blog. In Figure 2 I was trying to show how someone might try to use the thermal pathway out of the top of the device to enhance the device cooling. My point was that even if we can describe the different paths in terms of “Rth” numbers, we cannot simply combine those paths in series and/or parallel combinations. The analogy with electrical resistances does not hold. The purpose of Rth numbers is simply to compare the characteristics of different package types under very specific, pre-defined conditions. They should NOT be used when attempting to design a system. Please see JEDEC standard JESD51-2, Section 1 for more on this. Hope this answers your question… Best regards, Chris.